CAP is famous for making fitness equipment for commercial fitness facilities and home owned gyms to fill out a large retail space with the trusted and certified equipment. 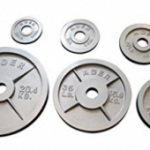 Though, CAP Barbell is mostly recognized of producing strength training equipment in which the making of one inch or two inch plates are also included along with kettlebells, dumbbells, squat stand and many storage accessories. n CAP’s Olympic Weight set is one of the most highly rated CAP Barbell equipment and it doesn’t matter whether you are a starter or a professional Weight Sets Review lifter, this weight set is compatible and is suggested for both of them. In one set of CAP Olympic weight there are 14 CAP Cast Iron plates included which can help you to perform variety of exercise to meet your desired fitness goals. 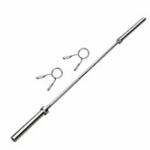 The bar may be of quiet low quality, especially for starters and may also require rubber bumper plates due to the strong cast iron plates to perform the oly and crossfit lift. But if your focus is mostly on squat, deadlift and bench press then it will be just a matter of time of getting your body being used to with only and cross fitexercises too. 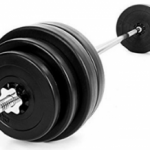 The CAP Barbell 300lbs. Olympic set is a weight set specifically made for people who are having a low budget but still want to expand their home gym as they are fitness enthusiast. In one set, there are two 45lbs. weight plate, two 35lbs. weight plate, two 25lbs. weight plate, two 10lbs. weight plate, four 5lbs. weight plate and two 2.5lbs. weight plate include. Along with them, there are two spring lock collars with a seven foot long Olympic bar. The total weight of all the plates is 255lbs. having 45lbs. weight of the Olympic Bar hence, giving you a total of 300lbs. of complete CAP Barbell set. The weights are constructed with Cast Iron having a certain grip which makes the plates easy to carry around. Having so much weight you can conclude that the CAP Barbell 300lbs. Olympic set is perfect for advanced weight training exercises. Though, giving you an option of purchasing extra additive weight if you may require in future. 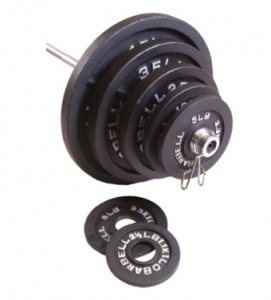 If you are a beginner, the CAP Barbell set may be too much for you since you will be using only short range of Weight Sets Reviews for some time and the remaining heavy weight will be kept in a certain place having dust for a while. But still the set is pretty much affordable and will allow you to grow with increment of only 2.5lbs. step by step. The shipping provided with this set is nearly free for the ones who are purchasing this set by a renowned website like Amazon, Walmart, EBay etc. or from certain stores. Thus, making the overall purchase of CAP Barbell Olympic seteven more budget friendly. You have to note, that there is a certain issue from the bar regarding its quality. 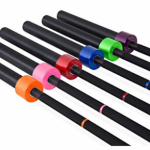 The bar is reported for getting scratches very easily which may lead to have flakes of it on your hands and other places,which may subsequently lead you to buy another bar that could give you more safety than the one with CAP Barbell. Though the bar may not be one of the best invention by CAP Barbell in its Olympic set but the weight plates pretty much makes the work done. Sometimes, there could be an excess of rubber in your inner parts of your weight plates which makes the plates difficult to slide down the bar. So to reduce that issue, apply a bit of oil or grease on the bar or you can even smooth out the rubber with a filer to make it the rubber easy sliding on. There may be a certain issue of missing parts and plates in your shipment, so make sure to verify what equipment along with parts, plates and manuals you are ordering and at the time of receiving completely check them with its specifications. Since, weights like these are sent in many shipments and in different boxes, so there is a certain possibility of human error which can make your experience of purchasing online worst. CAP Barbell Olympic Set doesn’t really focus much on looks and design, so it may be discomforting to use for some people having different taste. Items are shipped in more than one box thus arriving separately. Includes seven foot long Olympic Bar. There are two 45lbs, two 35lbs. ; two 25lbs. ; two 10lbs. ; four 5lbs. ; two 2.5lbs. weight plates included in a set. 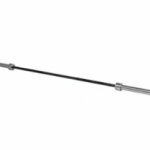 The weight of the Olympic Bar is 45lbs. which may give you a combine total of 300lbs. of both plates and bar. Strong Spring clip collars are included to make the plates remain in their place. The design of a grip on plates makes them easier to handle. Excellent for professional weight lifting exercises. 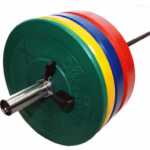 In my opinion, the weight set by CAP Barbell is a simple standard Olympic weight set. When I first purchased it I got them in steel and with a discount, I personally think it’s a great deal. The bar comes with an enamel black finish which is good because chrome platted bar may lead to chipping and even rusting. The bar is pretty much decent as criticized in the above description by many users. It can withstand a weight of 300lbs. very easily and won’t bend or break too easily. If you want to buy a bar that holds more than the weight stated you have to pay extra amount of cost which could be equivalent to the overall Weight sets Reviews 2018 . The bar comes in a bit older design so it may be needing some work and maintenance like tightening of Bolts to keep the sleeves attached and also some oiling to make the weight plates slide down easily and prevent the bar from getting rust. Whereas, on the inside you may need to apply grease to make the bearing work smoothly without any choking, wobbling and clanging. If you won’t follow all these steps than I’m pretty sure that the bar won’t last long. As far as plates are concerned they have some appearance issues like paint and shape and also doesn’t gives a traditional old school look. But the basic function of plates which is to provide weight is really up to the mark, so I do not really care about the looks and paint issues. Overall it is a pretty much good set, having a budget friendly price tag. Very much affordable with good set of weights for a starter. Consist of a plate set of 255 lbs. with 45lbs. bar included. The design of the plates makes them comfortable to use as it consist of a rubber grip. The weight of 300lbs. is enough for most of the heavy lifter. Needs maintenance like oiling, cleaning and even filing of rubber plates to make them durable. Not having an appealing design, when talking about looks. The bar is made of very low quality, so avoid adding additional weight over 300lbs. in it. The bar can break and have scratches easily. You may be needing a separate bar.